Thank you for supporting the future of Alpha Sigma Alpha! 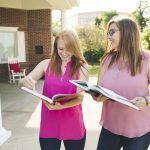 Membership in Alpha Sigma Alpha is a lifetime commitment, and annual alumnae dues encourages and provides alumnae sisters with an opportunity to reconnect and give back to Alpha Sigma Alpha while supporting important initiatives. Help us continue to advance Alpha Sigma Alpha and develop women of poise and purpose. Q: How much is the annual alumnae dues? Q: What is the purpose of annual alumnae dues? Q: Are there incentives to paying alumnae dues? A: Yes! Annual alumnae dues will help Alpha Sigma Alpha excel, and as a thank you, members who participate will receive many perks. Incentives include, but are not limited to: annual gifts, first-in-line to register for alumnae-exclusive events, first access to alumnae-exclusive programming and more. Q: Is payment alumnae dues required? A: Payment is not required to be a member of Alpha Sigma Alpha. Required participation for volunteers is outlined under “My commitment as an Alpha Sigma Alpha volunteer” in the national policies and procedures. In order to be a voting delegate at the National Convention & Leadership Conference, volunteers, alumnae chapter delegates and advisor delegates must be current alumnae dues-paying members. Q: Why do we have annual alumnae dues? A: Alpha Sigma Alpha has fully dedicated itself to being a progressive organization for developing women of poise and purpose. We are continually and strategically exploring best ways to expand our support and offer even more benefits for sisters at every level of membership. Q: Didn’t I already pay a lifetime membership fee? A: Depending on your year of initiation, you may have paid a “lifetime fee.” At that time, this fee was applied to an operating budget that focused almost solely on collegiate chapter operations. In order to continue to provide the best programming and sustain an operating budget for our entire membership, the national organization needs alumnae to contribute to these programs. We are asking all alumnae to support Alpha Sigma Alpha whether or not you have paid a “lifetime fee” in the past. Q: Will I still receive the Phoenix of Alpha Sigma Alpha Magazine if I do not pay my alumnae dues? A: Yes. All members will still continue to receive the Phoenix of Alpha Sigma Alpha. Q: Are annual alumnae dues tax deductible? A: No. Alpha Sigma Alpha Sorority is a 501(c) 7 organization which means membership fees cannot be used for a tax deduction. Donations to the Alpha Sigma Alpha Foundation are tax deductible. Please visit the Alpha Sigma Alpha Foundation website to see the great work the Foundation is doing. Q: I already give to the Foundation. How is this different? A: The annual alumnae dues benefits the Sorority’s operating budget and is not meant to replace your generous donations to the many outstanding organizations, leadership training programs and scholarship and grants that the Foundation supports. We encourage you to continue donating to the Foundation at whatever level you can. Together, a strong Sorority and Foundation are needed to create the dynamic, successful Alpha Sigma Alpha we all envision for the future. Q: Are annual alumnae dues the same as paying local alumnae chapter dues? Can I pay my annual alumnae dues thru my alumnae chapter? A: No and no. Each alumnae chapter sets its own local dues and you will still be responsible for the amount of local dues if you belong to an alumnae chapter. Alumnae chapters will continue business as usual with determining and collecting local dues. Individuals are responsible for paying their annual alumnae dues by following one of the two payment options listed below and will not be able to pay their annual alumnae dues thru their alumnae chapter. A: Alumnae dues must be paid by May 31 each year, as this is the end of Alpha Sigma Alpha’s fiscal year. Q: How can I pay my alumnae dues? Q: Who can I contact about alumnae dues?